A whopping 380 teams competed at this summer’s Amateur Athletic Union/USA Roller Sports Junior Olympic inline hockey championships in Orange County and one East County skater, in particular, made his presence felt on the playing surface. David Baldwin, who earlier this year led West Hills High School to the CIF-Metro Conference Kiwanis Cup roller hockey championship, returned home from the massive 1,268-game Junior Olympic Games event with three trophies. He helped lead the San Diego Stingrays club team to the 18U-AA Tier 2 championship and also captured fastest skater and hardest shot awards in the skill competitions. Baldwin clocked 101 mph on a radar gun in the hardest shot competition and timed 13.6 seconds in the fastest skater competition. Both winning marks were among the best ever recorded in Jr. Olympic Games history. For his winning efforts, Baldwin came away with more than $1,500 worth of gear — skates, sticks and wheels. Baldwin, who is planning to play for Grossmont College’s inline hockey team this fall/winter, said he was “thrilled” to be able to represent the San Diego Stingrays at the AAU Junior Olympics. 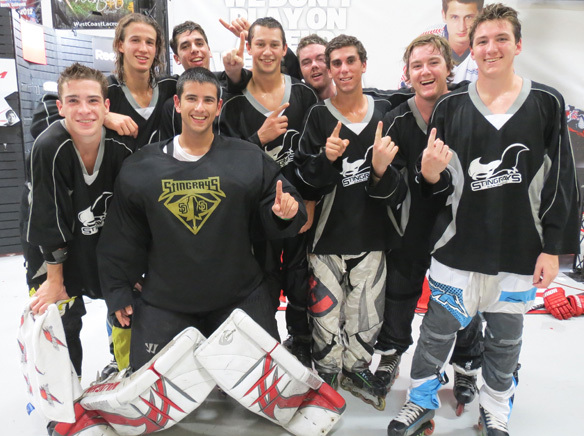 “Winning the U18-AA championship and two different skill contests was the highlight of my summer and it demonstrates that the Stingrays are becoming one of top roller hockey clubs in the country,” he said. This summer’s AAU Junior Olympic Games took place July 11-21 in Huntington Beach and Irvine. The event proved to be an international showcase, with teams from 25 countries participating. The top four teams in each division earned medals: gold (first), silver (second), bronze (third) and copper (fourth). The Stingrays put on an impressive showing with gold medals in 10U-A (Tier 2), 14U-A (Tier 2) and 18U-AA (Tier 2), silver medals in 16U-A (Tier 1) and 18U-A (Tier 1) and a copper medal in 21U-AAA. Overall, six of the eight Stingrays teams entered in the event medaled. 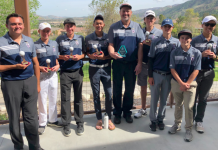 West Hills goaltender Miguel San Martin and West Hills freshman Robby Baldwin were both rostered on the gold medal-winning Stingrays 14U team. Stingrays program director Kristy and Ron Smith noted the program continues to grow and this year brought three new coaches into the program.